Partly, I'll blame Yuri for this. 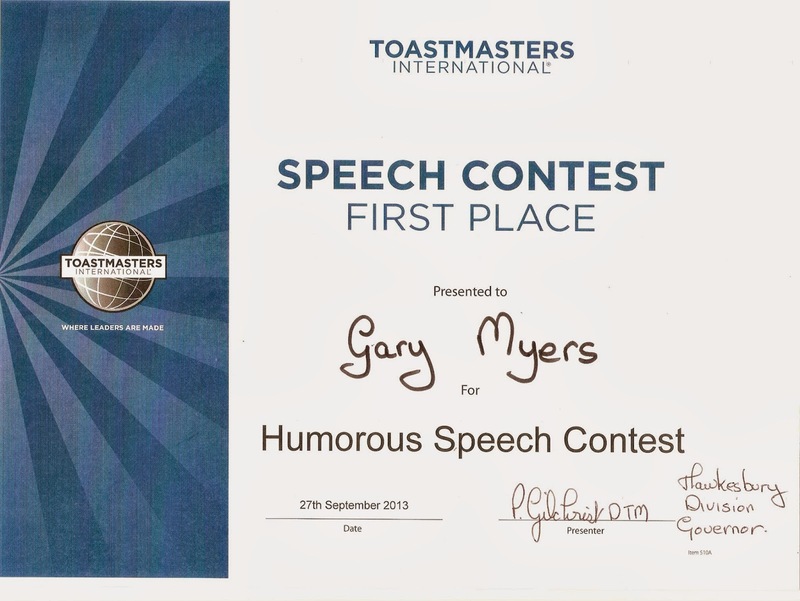 He recommended Toastmasters as a way of getting some extra public speaking skills. Luckily for me, there's a group that meets one lunchtime a week at work, which makes attendance relatively easy. Much easier than trying to fit in an evening on top of my kids' busy social and sporting calendars. I started going just before Christmas and became a paid up member in January this year. 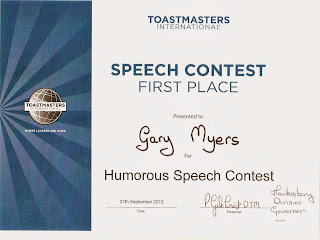 Next, I'll blame Neil Sequeira who prompted me to enter the club contest a month ago on the basis that attendees regularly laughed at my speeches....in a nice way. I won that, and then it dawned on me that I'd be going into the Area level contest. Our club was hosting that event, so I had a slight 'home ground' advantage, but I was still in front of a bunch of people I didn't know, most of whom have been honing their speaking skills for YEARS. I won that, which meant going up to the Division level contest last night. That was in a church hall, unfamiliar territory for me. We were speaking from an elevated stage, and with a headset microphone. Getting into the big leagues. I was a bit ruffled because my trip there was delayed with my phone unaccountably deciingd it couldn't find any GPS signal, and refusing to tell me where I was or how to get where I was supposed to be. My destination was the other side of Middle Harbour so my regular tactic of pointing the car vaguely in the right direction and hoping for the best was foiled by its inability to fly across the water. Resorting to my trusty and dusty Gregory's Street Directory I made the 40 minute journey in a mere 80 minutes. My speech starts with the other Gary Myers, multi-time champion of Summernats (which I've mentioned before in my blog ) and land speed record holder. Oh, and candidate for one of the NSW Senate spots for Federal parliament. He didn't win, but a candidate for the same party did get a spot for Victoria. I suspect this came as somewhat a surprise to him, as the Senate voting system is complex and highly unpredictable. An unemployed ex-sawmill worker who didn't own a suit and has kangaroo poo chucking as a hobby will be an interesting addition to the chamber. I was more than happy with my third place finish in the contest. 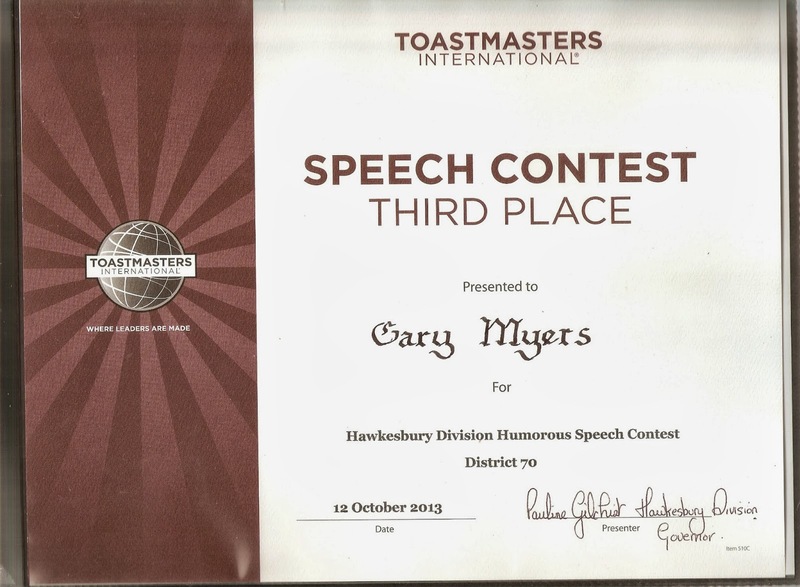 The winner, who also took the Table Topics contest top prize, was excellent. And second place went to a Dave the Happy Singer who took the mick out of homoeopathy and similar rubbish, so I won't criticise that. I get a small trophy and a certificate. And an update to my LinkedIn profile.